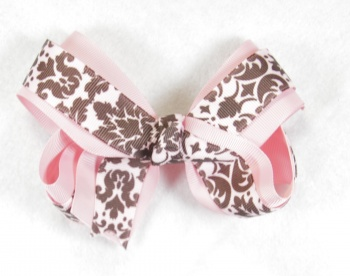 This is a double layered bow sporting the chocolate brown paisley. The bottom layer is a 1.5" pink grosgrain ribbon that is lined with a 7/8" pink with chocolate brown paisley grosgrain ribbon. It is wrapped in the center with the paisley print into a French knot and attached to a French clip.